Price is per 16-inch string of these gorgeous beads, beautifully polished. each will be slightly different size and shape - but largest average size is 8mm x 7mm x 6mm, about 53 nuggests to the string. 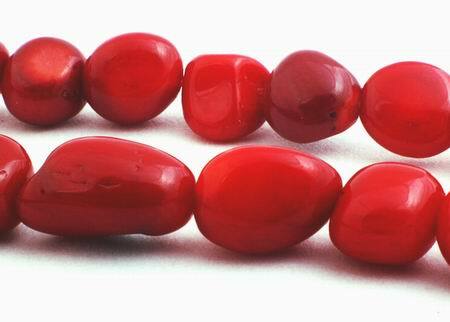 Coral is known to be used as a gem since prehistoric times. With a history of religious meaning and is one of the seven treasures in Buddhist scriptures. Coral was long thought to be a strong talisman against bleeding, evil spirits, and hurricanes. Its color ranges from white to red. It grows in branches that look like underwater trees. Most coral is found in the Mediterranean Sea or in the Pacific off Japan and Taiwan. When you say the word coral, most people think of the coral reefs in the South Pacific like the Great Barrier Reef off Australia. However, these coral reefs are formed by a different species than the coral traditionally used in jewelry Corallium rubrum and Corallium japonicum. Almost all red coral these days is white coral dyed.